The new year is upon us, and there is no better time to take stock than right now. It’s healthy to take a few minutes to evaluate what you have achieved, what you want to work on, and how to get there. And that sentiment is running strong at this time of the year! After all, how can you know where to go if you don’t know where you are? To do this, I like to employ a powerful method called the Level Ten Life. Level Ten Life is a method from the book The Miracle Morning by Hal Elrod. This incredibly effective tool is amazing no matter the time of year, but there’s something about the new year that makes it especially potent. You can learn the methodology in more detail here, but here’s the gist: You create a chart that has ten categories and ten levels. Each category is a piece of your life, like “Health” or “Career.” Then you take some time to rate how happy you are in those categories. To do this best (especially with the chaos of the holiday season), you need to take some time and do this alone. Don’t try to sit down for this introspective session in the middle of a crowded room with your family all around. Don’t try to complete your Level Ten Life while you’re watching your favorite holiday movie. And don’t ask someone else for their feedback to help judge each category’s level! 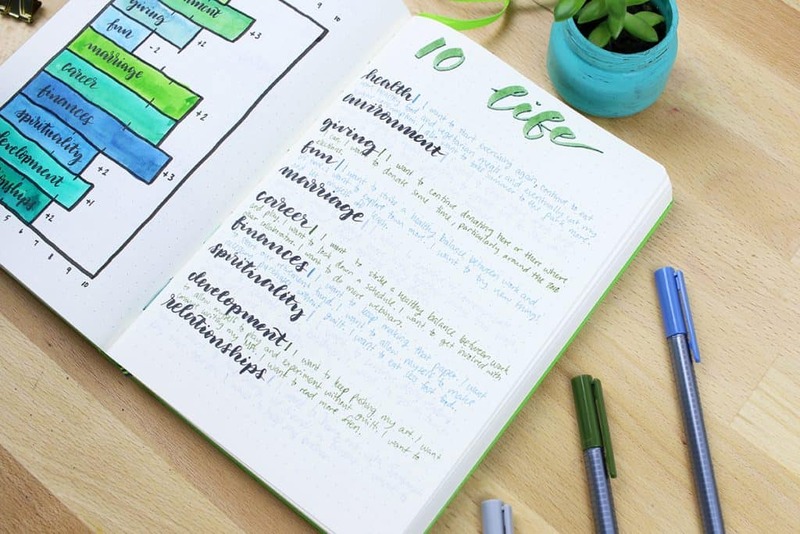 I decided to include the Level Ten Life in my 2018 bullet journal spread because it was the perfect time to sit down and focus on my life. You need to decide this for yourself without the bias of others. The reason you need to lock yourself away while you complete your Level Ten Life is that this exercise requires you to be honest with yourself. You need to be able to sincerely evaluate each of the ten categories and determine how happy you are. This can be a little bit painful if you discover that you really aren’t happy with a certain aspect of your life (or multiple). But I promise, coming to these hard truths are exactly what you need to make your life top notch in all categories! 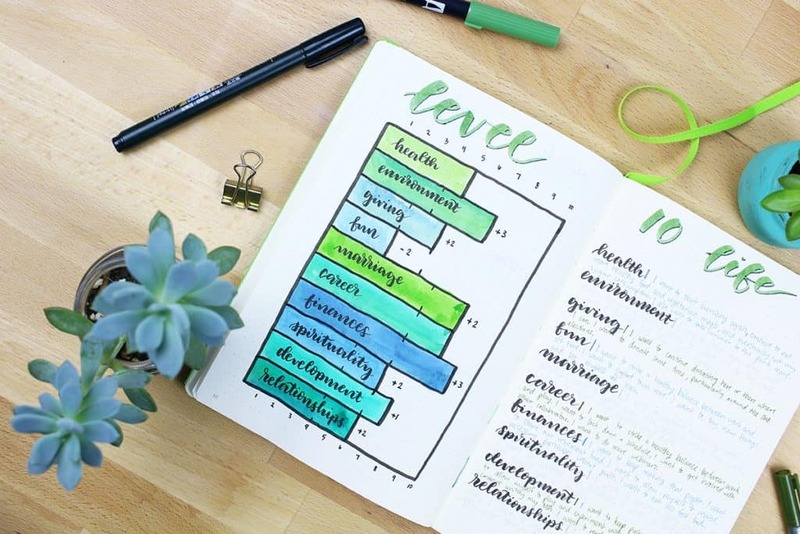 After you have decided the levels for all ten categories of your life, you can write a list on the next page for each category. There, you can list out all the ways you want to improve all the areas of your life. 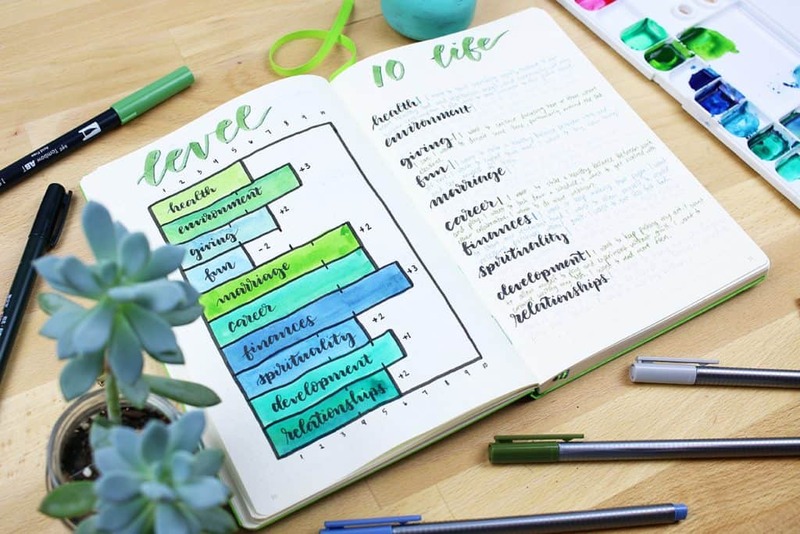 Write out what things you can do to make that area of your life a level ten. For example, for my “Fun and Recreation” section, I wrote out that I want to leave the house more and have more fun day trips to locations like museums or coffee shops. For my “Relationships” section, I wrote that I want to spend more time with my friends by creating some kind of a game night or movie night. 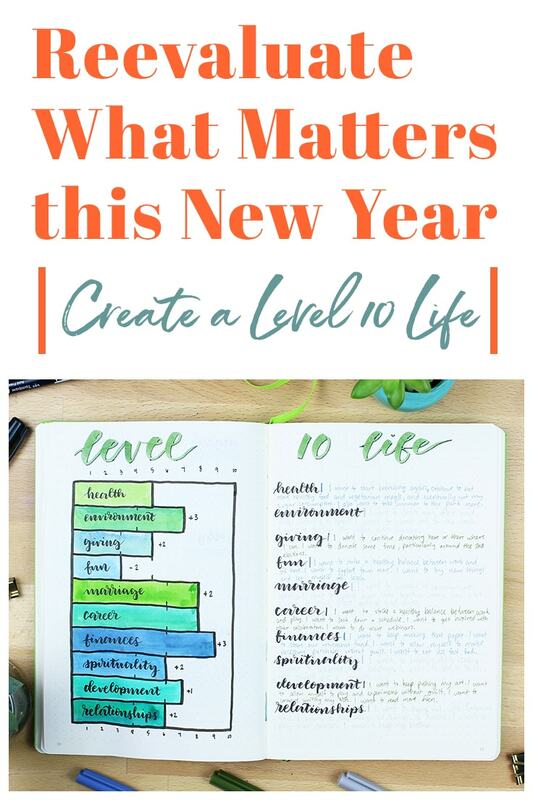 Whatever your goals for the new year may be, you will always find benefit in creating a Level Ten Life. There’s nothing like taking some time to look inward and really reflect on your own happiness. Even if you find you aren’t particularly thrilled with a certain aspect of your life, you will walk away feeling lighter and refreshed. When I first started this technique almost two years ago, I had much lower satisfaction in literally every single category of my life. Since I’ve started creating my Level Ten Life charts, I’ve seen nothing but growth and positive change. 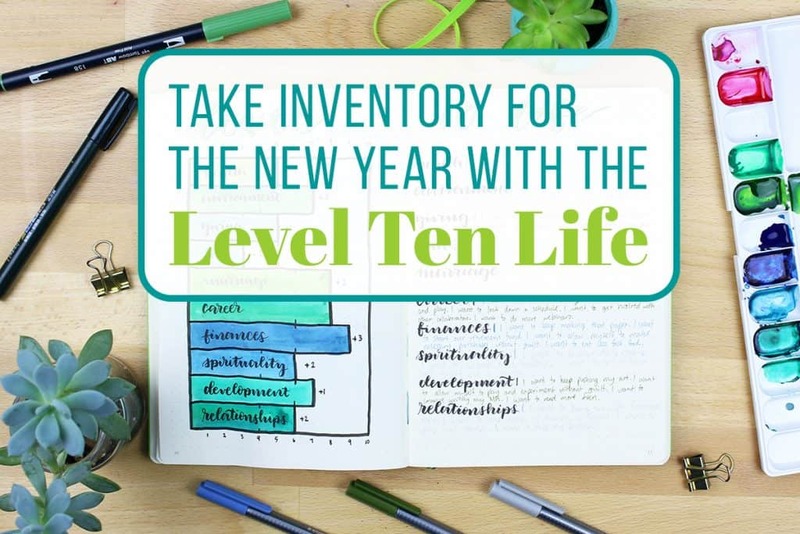 So take a half hour this holiday season, sit down with your favorite pens, crank up your favorite music, and take stock with the Level Ten Life chart. There is no better way to start the year. Sure thing, Eda! You can adjust it however you like to make it reflect your life and your goals. Go for it! Do you prefer the hard back or the softback Journal Book? And do they both lay don flat while working on them? I prefer a hardback journal myself, but I still love softback journals too! With the Leuchtturm series, I always find that the journal lays flat and is easy to work with. I hope that helps, Debi!